New York-based comedy improv group Action Pals sat down in GameDaily's offices to produce this dead-on review of Street Fighter IV. The group take to task Capcom for their Mexican stereotypes, hamburger-chested women, and call out little know Street Fighter spin-off, Street Fighter for Girls. 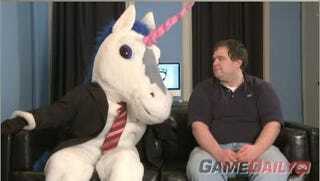 Did I mention that one of the reviewers is a surly unicorn named Al?